Hey, Snack Girl - that isn’t even a photo of a vegetable! Are you asleep or something? The truth is that I have been chopping vegetables without the proper technique for years and I finally decided to do something about it. 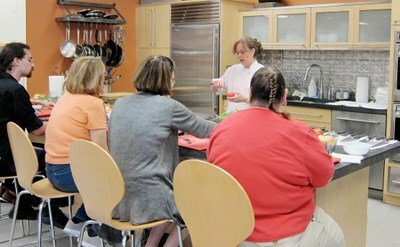 I signed up for a class at a local cookware store, Different Drummer’s Kitchen led by Lynn Sunderland. Why? The path to healthy eating includes learning new skills. I find that now that I am eating more vegetables I chopped a lot more than when I used to pop a frozen pizza in the oven. The time it takes me to chop (forever) is one of the reasons I want to dial the number for take-out. I stand in my kitchen when it is my turn to cook, while my husband winces, and chop, dice, and mince. He winces because he brought a lovely chef’s knife into our lives and I am famous for dulling it. Did I have time for this? No. Did I enjoy myself? YES! Did I learn anything that will make me more efficient in the kitchen? Absolutely. The biggest “AHA” came from the first 10 minutes of the class. Below is a video on how to hold a knife. I was using the “hammer hold” all these years! It makes a huge difference to hold a knife with the pinch grip. 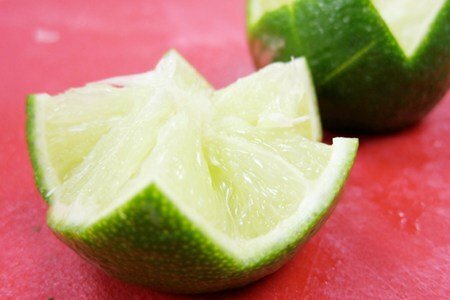 I also used my paring knife to make the above lime garnish with a zig zag pattern around the lime. I am really scared of knives so having someone encourage me that I won't slit open my hand was very helpful. My second "AHA" was how to use the knife on the cutting board to quickly cut vegetables. This is an awesome video on how to slice with the knife. Watch it over and over and practice and your life will become easier (I promise). Do you know how to use a knife? How did you learn? I found this very helpful also. Never really thought about the proper way to hold a knife. Now I just have to tell myself it is worth it to invest in a good quality ($$$) knife! thanks for the info. I do cooking lessons from time to time as part of my personal chef business, and knife skills are always topic #1. :) I never had a clue either until culinary school. The proper grip just feels right; it's right up there with the "right" feel of good sharp heavy knife - it does half the work for you! Most recreational cooking class places will offer knife skills classes these days, as do stores like Sur La Table, Williams-Sonoma, etc. Definitely worth it, as the confidence boost you get removes a significant barrier to cooking with veggies. Good info - I've been using the hammer hold all these years too! I've thought about taking a knife class for a long time - thanks for the encouragement! I hate taking the time to chop veggies but if I was skilled at it, I would enjoy doing it - and would do it more often. Love chopping, it is therapeutic. I take all my items to chop, grab a cutting board and head outside under the umbrella to prepare the veggies. I've taken some cooking classes which include a review of knife skills but very limited to hands on and have been taught this. I have still been using the hammer hold, even though I knew better. 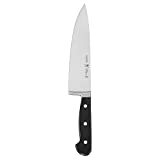 I just looked at my knife and the reason is my very expensive in 1997 Pampered Chef knives don't have a proper heel transitioning the handle to the blade. I think it's time for me to get a new chef's knife! I have absolutely 0 knife skills. And I had no idea how to hold a knife, so that video just taught me my first knife skill! :) I guess I've never paid attention to how I hold enough, but I think I use both the pointer and the hammer hold. I'm kind of excited to try out the proper hold tonight! I don't dislike chopping veggies, but I know beyond a shadow of a doubt that it goes WAY slower than it should because I don't really know what I'm doing right now. I learned from TV. Yes, I watch too much TV, but I love to learn new things and it's sometimes the only way when you live in a very small town. Now that I'm in the city, it's also a cheaper way. I took a knife skills class and it changed my life! I know that sounds silly, but I can't even tell you how much more efficient I am in the kitchen. Yay, loved the vid with Chef Paul, I go to his blog all the time for tips and recipes (he' no longer with About). I have expensive knives I bought in Germany, love my knives but I am notorious for slicing myself up, my husband said he is going to take my knives away and get me some dull ones :p After watching the vid, I am hammer hand with my thumb out. Thanks Snack Girl! I bought my 1st Henckel knife set in my early 20's (on incredible sale) and don't know what I would do w/o a good sharp knife. Invested in Chef's Choice knife sharpener and has made a big difference keeping them sharp over the 30+ years. Would love to take a class...everything I learned about knive skills came from watching FoodNetwork :) If considering a purchase, the ones I use the most (in order): Chef's knife, sharpening steel, paring, serrated; rarely use others except for slicer. Look for when the sets go on sale! Several years back, I gave my mom my Henckels b/c she has never owned a good knife + bought a set of Wustof (on sale)! I just want to say thank you! I have learned so much wonderful and helpful information from you and I can't thank you enough! Everyday i learn. Thank you for sharing all your knowledge with us and the time it takes for you to post it. We've got a nice Cutco chef's knife, so now I just need to practice the right grip! I learned from my parents (home chefs) and then I spent many, many hours watching the Food Network about 5 years ago (when their programming wasn't all just competitions). I also worked in a store that sold high-end knives so I learned a lot about the first step of knife skills- using the right knife for the right job.